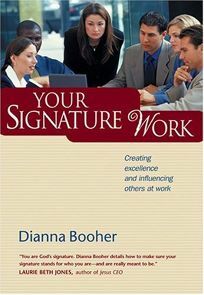 With many employees facing burnout and feeling overwhelmed in the course of a work day, it may be too much to ask that they be willing to put their""signature"" on their work as if it were an artistic masterpiece. Yet that is what Booher, a business consultant and author (Speak with Confidence; The Esther Effect), encourages readers to do. Drawing upon biblical examples as well as real-life business situations, she calls for personal integrity in the workplace and in all areas of life, asking people to offer their very best effort all the time. Booher employs a basketball metaphor for the whole book: readers need to learn to play offense rather than defense, admit their fouls, learn multiple plays, call frequent huddles, keep track of their stats, turn hecklers into fans and always practice as if it were a real game. Also, they need to enjoy the off-season and multiply any endorsement offers. This hackneyed analogy grows old quickly and actually detracts from the sound advice contained in the book, which calls for dedication, passion and commitment to a cause. Such a noble message of personal honor and professional thoroughness does not deserve to be undermined by a pervasively cheesy basketball analogy. Somebody call a timeout.